Incredible double shot from the mighty Public Enemy on 7" vinyl. One song each from their dynamic duo of 2012 albums, "Most of My Heroes Still Don't Appear on No Stamp" and "The Evil Empire of Everything." Extremely limited in full color sleeve. "Man Plans God Laughs," is the brand new album by Hall of Famers Public Enemy. Chuck, Flavor, Lord, Griff, G-Wiz and the S1W's return for another album, bringing you all new music. 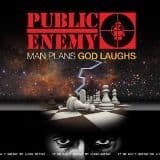 If you thought your favorite PE album was "Apocalypse 91," wait until you hear this one! Clean version. ... Greatest Rap Hits Digitally re-recorded and remastered versions of the Def Jam classics! Includes digital download card with three extra tracks: PE#1, Harder Than You Think (London Radio edit)and Shut Em Down (Pete Rock Mix).